The Place de la Concorde was built between 1755 and 1775. Renamed Place de la Révolution during the French Revolution, here is where Louis XVI and Marie-Antoinette were executed. 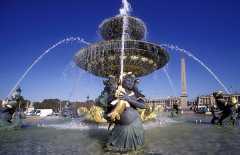 Nowadays it is one of the most elegant square in Paris, with its fountains and the majestic obelisk from Egypt.